Otto Wagner, a remarkable Austrian architect and scholar, who is widely considered the founder and pioneer instigator of the modern movement in European architecture. 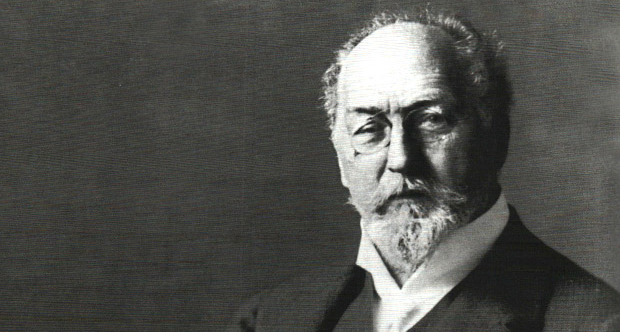 Otto Wagner was born on July 13, 1841, in Penzing, Austria. He attended the Technical University in Vienna, and later, he moved to Berlin in 1860, and enrolled at the Bauakademie. The next year, he was accepted at the Academy of Fine Arts in Vienna, where he studied for the next three years. In 1894, he received his first academic appointment, as Professor of architecture at the Vienna Academy of Fine Arts, he served this position until 1913. Wagner was an unconventional teacher, who broke away with traditional methods, and focused on the basics elements that dominated architectural planning, such as material, structure and function. Even though several people were critical of his methods, his lectures were extremely influential, and were published in 1895 as, “Moderne Architektur”, which was released in an English version, “The Brick-builder”, in 1901. During the early years of his career, Wagner was influenced by the Neo-Renaissance style and most of his architectural practice up until 1894, reflected the principles of the Neo-Renaissance and Neo-Baroque modes, for instance, the private recluse Rennweg 3, Vienna, which is a Baroque style, palatial mansion decorated with traditional and cultural artifacts. In 1893, he won a huge competition for Vienna, his general plan was much applauded, but it was never executed. His projects for the Academy of Fine Arts reflect the intermingling of the classical planning principles taken from the Roman imperial fora with an assertive commemoration. However, the open metallic crown gracing the top of the main building adds a unique modern touch. Wagner was a principal advocate and instigator of modernism, and he pointed out that, “Modern art must yield for us modern ideas, forms created for us, which represent our abilities, our acts, and our preferences”. His radical and rationalist functionalist approach had an influential impact on the architectural community, and resulted in the revolutionary evolution of architecture. In 1894, he was appointed to design the stations of the Stadtbahn, Underground Railroad of Vienna. The same year, he became a prominent member of the Vienna Secession, and remained an active member until 1905. Towards the start of the 20th century, Wagner seemed to brush off the influences of the Neo-Renaissance mode, and his designs appeared to have adopted the principals of the Art Nouveau style. In 1904, he was commissioned to design the Sankt Leopold, the church of the Steinhof Asylum, Penzing. The same year, Wagner was commissioned for a project that ultimately became his magnum opus, the Postal Savings Bank in Vienna. A work that is a remarkable illustration of accurate symmetry, linearity, sleekness and precision of art. The outer walls of building were done in marble revetments that were attached by exposed aluminium fastenings, while interior, delicate and graceful in appearance, was lightly embellished with glass and metal. This building established Wagner as a notable and celebrated architect of the 20th Century.